Mardi Gras, USA - "Mardi Gras (Fat Tuesday in English) in New Orleans, Louisiana, is a Carnival celebration well-known throughout the world. The culmination is the wicked mayhem of Mardi Gras Day (also known as Fat Tuesday), when all inhibitions are let loose. Carnaval, Brazil - The Carnaval in Rio de Janeiro is a world famous festival held before Lent every year and considered the biggest carnival in the world with 2 million people per day on the streets. The first festivals of Rio date back to 1823. Harbin Ice and Snow Festival - Harbin, China -A festival exhibiting the most exquisite ice and snow sculptures in the world. Every year people build incredible things out of ice and snow, decorating them with lights and lasers. This exhibition has a lot to offer, one can only find out after visiting it. 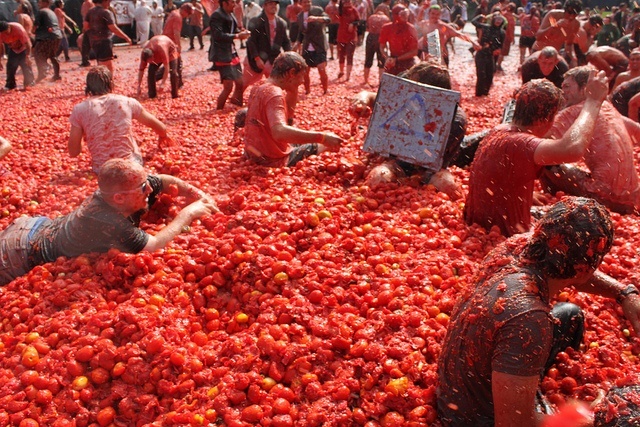 La Tomatina, Spain - "La Tomatina is a festival that is held in the Valencian town of Buñol, a town located 30 km inland from the Mediterranean Sea in which participants throw tomatoes and get involved in this tomato fight purely for fun. Holi - India - "Holi, or Holli, is a spring festival celebrated by Hindus, Sikhs and others. It is primarily observed in India, Nepal, Sri Lanka, and countries with large Indic diaspora populations, such as Suriname, Guyana, South Africa, Trinidad, United Kingdom, United States, Mauritius, and Fiji.